It has been over 12 months since I made my acting debut in my friend’s original one act play; Max Pry, Private Eye. It wasn’t something I had ever considered, but when the opportunity came up, I grabbed it with both hands and threw myself into the deep end. What I got was a fantastic experience with a bunch of wonderful people, and the acting bug. Recently, I was given the opportunity to be a part of another production, and you can bet your butts that my answer to the question of my participation was a resounding yes. 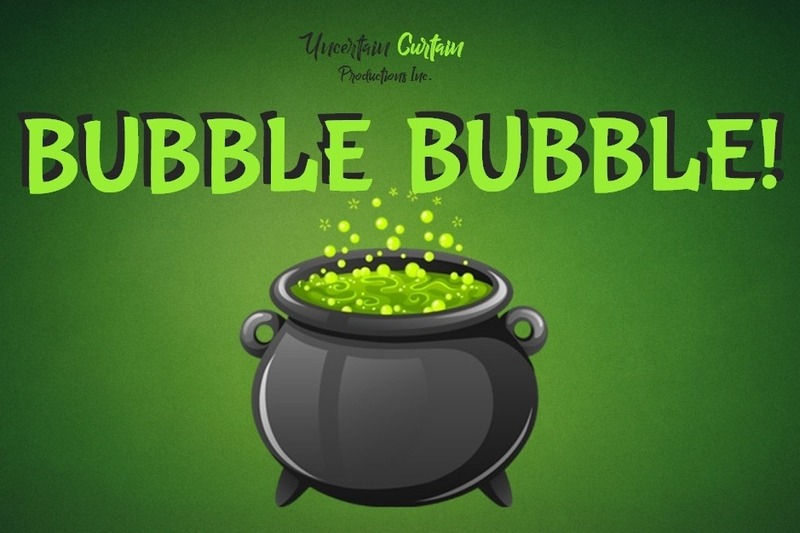 Uncertain Curtain’s first ever play as an official theatre company, is called Bubble Bubble, and is a comedic retelling of The Frog Prince. Written by our fearless leader, Sarah-Jane; Bubble Bubble is witty, clever, and features a cast of kooky characters that you can’t help but love. Half our cast are kids under 12, and the rest of us are adults…though we act like 12 year olds a lot of the time, let’s be honest. So, as you would expect, our rehearsals have been a bit of a whirlwind. But, with our performance dates just a few short weeks away, it’s coming together really well and I’m excited to get on stage again. Theatre is a fantastic creative outlet, and the more involved I get with it, the more I want to stay involved. Being on stage is a buzz like no other, and I’m thankful that I’ve been given another opportunity to get up there. Whilst I’m still a novice at this whole theatre thing, it’s such a fun and rewarding experience and I’m really looking forward to seeing the end result of our current performance endeavour. This weekend we performed our play, and it was one of the most fun and incredible things I’ve ever had the pleasure of being a part of. Written by my incredibly talented friend, the one act play, titled Max Pry, Private Eye, is set in the late 1930’s and follows the story of Max Pry; a detective who dreams of becoming a famous private investigator. The problem is, Max is a terrible detective. In fact, his greatest bust (discovering Frankie “The Cruncher” Pavlov’s hideout in a down town laundromat) was purely by accident. So, when Max’s boss gives him an ultimatum that could see him demoted, Max teams up with some (equally terrible) gangsters to stage the bust of a lifetime! After three months of rehearsals, we took to the stage on Friday night for the first time and it went off without a hitch. Me, who has previously sang in front of crowds utterly shaking with nerves, found myself stepping onto the theatre stage confidently and without fear. Admittedly, that may have been because there is more involved in theatre that I had to focus on, but nevertheless! Our lines on-stage were delivered to perfection, and as I listened backstage in between my scenes, the other scenes ran just as smoothly. The couple of times we did forget a line, the ad libs were so good that nobody noticed a thing. We had three performances that each had the theatre almost full, and a good few of my friends and family showed up to see us perform, which was really awesome. The costumes, made by myself and our lovely production manager, looked fantastic and really helped make the show. The set, designed and made by our playwright’s father, looked sensational. Honestly, everyone involved did such a wonderful job and I am so proud of everyone that had a hand in bringing Max Pry to life. We even made it to the paper a couple of times, and we got a fantastic write-up about how the play was working to encourage neurodiversity in the arts. For those of you that may be unfamiliar with the word, neurodiverse is a blanket term used to describe autism spectrum disorders, ADD and mental health disorders, amongst others. The idea was a shorter play with a longer rehearsal time, to allow for those who may be suffering from neurodiverse disorders to be able to participate in a production that doesn’t have the high demand and stress level of a full length play. And I can’t even begin to tell you how kind and considerate the cast and crew were. My role in the play was that of Dotty, the femme fatale if you will, and I loved playing the character. Though, with her sass, wit and penchant for casting a dirty look, it was pretty much just like being myself…in a blonde wig. In fact, I was offered the role purely because the playwright and her parter (both good friends of mine) thought that the character would be perfect for me. And, in an attempt to step outside my comfort zone, I took on the role without hesitation. Honestly, it was such an incredible experience and I think I’d be keen to get back on the stage again at some point. But, for now, it’s been a long and busy weekend, and I think what I really need is a cup of tea, and a nice relaxing Sunday.